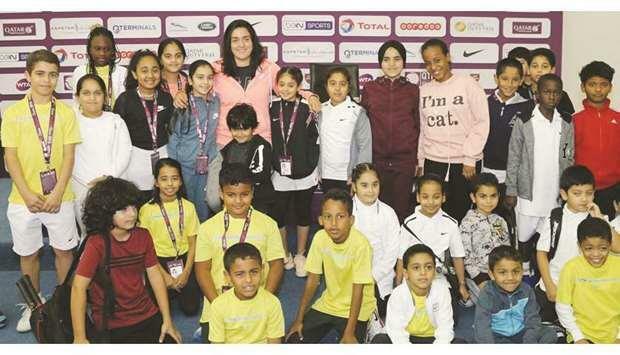 (MENAFN - Gulf Times) The Qatar Tennis Federation is known to come up with unique concepts. Yesterday they organised a pressconference with Tunisian tennis player Ons Jabeur ranked 56th in the world. But it was not journalists who were asking questions but wide-eyed children, mostly young tennis players affiliated to the federation. The questions they asked, however, were not childish by any stretch of imagination. We reproduce excerpts Jabeur's Q & A with kids here. A: I'm very proud to represent my country and all Arabic countries in my sport. My advice is to trust yourself and pursue your dream. Never get tired and do hard work to reach your dreams. A: Per day, like, around five to six hours. Every day till probably Saturday. I take some time off on Saturday afternoon and Sunday off. I'm allowed, right (smiling)? A: Favourite place? I like Souq Waqif. It's good there. A: Well, before, I wanted to be a doctor, but then I know how much work they do. Now, I don't know, I still want to be doctor, but I still have to put a lot of effort in that. A: I don't know. Maybe. I'm going to let them do whatever they want. I'm not going to pressure them to do anything. And if they want to be professional, I'm going to tell them it's going to be a little bit hard, but I'm going to try to push them and help them as much as I can.